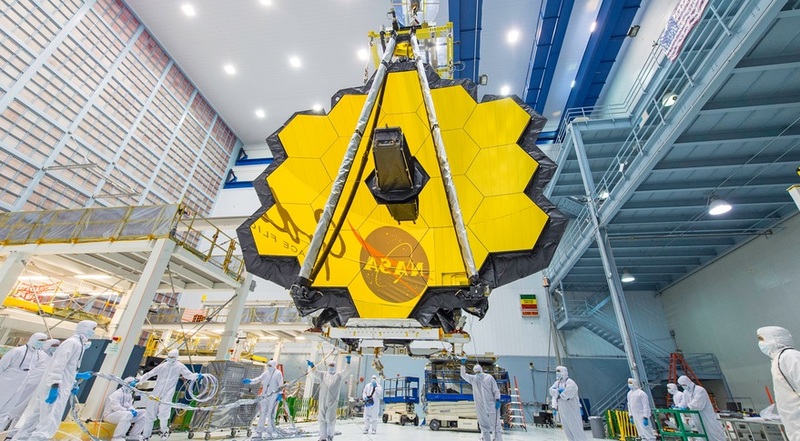 WASHINGTON — As NASA commits to performing another cost and schedule estimate for the James Webb Space Telescope, the chairman of an independent review board said he’s concerned about its ability to remain on track for a launch in two years. Speaking at a meeting of the Committee of Astronomy and Astrophysics at the National Academies’ Space Science Week event here March 26, Tom Young, who chaired the Independent Review Board chartered by NASA last year to review cost and schedule problems with JWST, said that since the agency revised the schedule of the mission last June work on the space telescope appeared be taking longer than expected. While the board completed its assessment last June, NASA brought the board back last fall to assess how NASA implemented its recommendations. Its final report on that assessment was released by NASA March 1. Earlier in the meeting, Greg Robinson, JWST program director at NASA, played down schedule concerns. “We’re doing pretty good with these milestones,” he said of progress on the telescope, “and that means we have good margin in the schedule.” That includes, he said, 60 days of margin for integration and testing of the combined spacecraft bus and optical elements, three weeks after the observatory arrives at the launch site and four months of reserve held at NASA Headquarters. However, he acknowledged that the program consumed the more than two months of schedule reserve that had been set aside for integration and testing of the spacecraft element at Northrop Grumman’s facilities. That margin was used up during vibration testing, he said, although he emphasized those tests concluded successfully. “Mission success is our number one aim,” he said. Thermal vacuum testing of the spacecraft is expected to begin this week, he added. Robinson said JWST’s standing review board will meet April 2 and 3 to discuss the status of the mission. “One of the things they’re going to pay a lot of attention to is the schedule: how we’re doing on the schedule, what are the risks against it, et cetera,” he said. The GAO report recommended that NASA performed a detailed review of the mission’s cost and schedule, called joint confidence level (JCL), to be completed no later than the system integration review scheduled for August. NASA had previously declined to do a JCL because, at this phase of the mission’s development, it concluded it could more easily estimate costs and risks based on remaining work. The GAO disagreed. “Conducting a JCL at system integration review — a review that occurs during the riskiest phase of development, the integration and test phase — would allow the project to update its assumptions of risk and uncertainty based on its experiences” testing the separate spacecraft bus and optical elements prior to integrating those two elements into a single spacecraft. In a response included in the report, Thomas Zurbuchen, NASA associate administrator for science, accepted the report’s sole recommendation to perform a JCL. That review, he said, will be completed prior to the system integration review. The independent review board chaired by Young came up with 32 recommendations. He said that, in the board’s later assessment, NASA was doing a good job implementing them. Of the 32, the board found that NASA had done an “appropriate” or “appropriate with additional work needed” job implementing 29 of them, ratings he likened to letter grades of A or A–. A third recommendation deemed inadequate dealt with giving NASA’s Launch Services Program the same responsibility for the launch of JWST on an ESA-provided Ariane 5 as it has for launches on American vehicles. While NASA has increased its oversight of the mission, that work has fallen short of the recommendation, Young said.